I actually don’t really like French toast because I normally find it too greasy, but since I love my ceramic pan, I gave it a go. This recipe is for a highly acidic person like me. I try to avoid a lot of things that could trigger an ulcer attack so I have replaced many ingredients that are normally used for French toast. 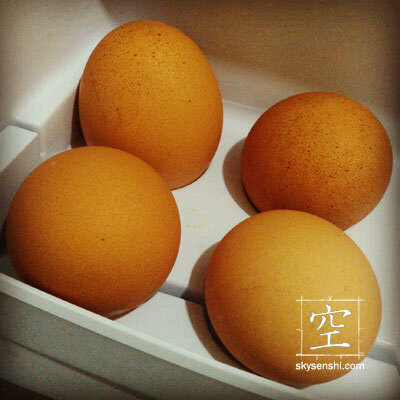 Cage-free eggs vary in sizes, unlike most eggs you find in the grocery, which seem to have uniform sizes. So you might end up using more than one if the eggs turn out to be particularly small. I used almond milk because cow’s milk tend to worsen my acid attacks, but you can use regular milk if you don’t suffer from any particular digestive disorder. You can use less than one tablespoon coco sugar, or more, depending on how sweet you want it to be. Coco sugar isn’t very sweet, so one tablespoon of it will not overpower your taste buds. Add the coco sugar and beat the mixture again. Dip the slices of bread in the mixture and then place the bread atop a pre-heated ceramic pan. Cook until both sides have been browned. I didn’t use oil here for two reasons: (1) oily food can trigger acid attacks, (2) I really do not like the feel of grease on my mouth. You can lightly grease the pan if it’s not ceramic, since conventional French toast uses oil or butter anyway. 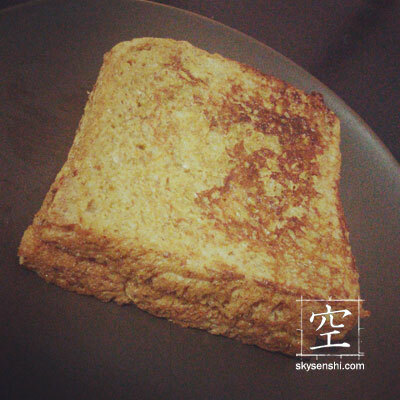 I love love love this version of the French toast! The coconut sugar and the cinnamon give it a subtle hint of sweetness. If it’s not sweet enough for you, you can add maple syrup or some other sweetening agent on it. My boyfriend is not a fan of desserts, but he finished up the rest of the servings because he loved it as well.